“Looking for the self” What do we know of the psyche and soul? The discussion was lead by two monks – the longtime Prior Claudius and Pater Otto, who is catholic priest, Jungian psychologist and as he always proudly announces, orginally a cheese maker. Segments of discussion were preluded from the two monks with some food for thought: first from a catholic view of the wise and senior Bavarian monk and then from a psychological view from the energetic, versatile, a curious (spiritual and intellectual) searcher in his soft American-Swiss accent. I have known both for a while, and do not go along always with their statements or definitions. As often, many of the brief thought nuggets answered my current questions and difficulties but also opened more topics to meditated and think about. Never before have I seen priest sharing so openly their lifelong process of believing, their doubts and trust in following Christ. The (Catholic) belief they presented and have lived is one of a unique joyful religion for this life, of boundless love, capable of deep mystic but also fully compatible with science and Jungian models. Do you think, the Prior (second in charge of this monastery) told the audience some conventual belief and bigot phrases? Think again, some of his statements would force both the official church hierarchy together with the noisy know-better-modern- lay(wo)men of today in a tailspin. A concise opening statement of the Prior summed up what one has to do in life and how that helps finding God. I was taken back by its simplicity. His crisp world view came across as a result of his own thinking and experience as a monk without giving psychoanalysis any deep consideration. But it could be easily matched to individuation of C.G. Jung. I included a crude visualisation below. Furthermore, the Prior eased my biggest problem with a personal god, having had my God experiences in the nature. First the Prior showed us a pantheon (almost Taoist) image of god, how it relates the inner center our Self: God is in everything and above everything or God does not exist. Quite frankly, that resonated well with me, since I felt god the first time, during a backpacking week around Mount Rainer (Wonderland trail). That is – God is in everything – after I crawled out of the tent and admired nature during the glowing sunrise. Secondly Claudius connected men’s outer world, with his inner world and with God – as an individual to a personal (Du to Du). It comprised what one has to accomplish in the first half of life ( and where materialism or Freud’s machine stops) and in the second part of life and beyond. C.G. Jung defined that without his empiric reach but definitely within his metaphysic view. Dealing with the outer world: You have a good meaningful job, live in a nice house, have a good handsome/pretty spouse,your kids turn out well. You sit down and see it is good. I think this relates to the developing an Ego and Persona in the first half of your lifespan. Later Pater Otto brought the Ego in an Example of a Gel Tub, how the Ego,the center of consciousness is needed as an outer communicator and shell to protect your our Self and our Soul. Dealing with inner world: You have to look into yourself think and meditate, rid yourself of the negative. (P. Claudius avoided saying evil or demons). You sit down and see it is good. I think this relates to the Individuation, overcoming the own Shadow and finding the soul (Anima). Later Pater Otto told us about the soul (lat. Anima, gr. psyche ) how this relates our psyche and psychology in general. Find your inner center: You have to look beyond this world, to find the loving God in you ( P. Claudius meant looking for our soul). Men is a communicating species, but you have to have found your inner center to do this successfully..You sit down and see it is good. I think this relates to the Individuation, overcoming the own Shadow and finding the Soul (Anima) and Self. Later Pater Otto told us about the Self, the forces in making cheese by steering in the milk and the Axis (the big pipe) between the Ego and the Self. Communicate with the personal god: You have to connect with the personal God using your Self as window (or membrane). You sit down and see it is good. I think this connects the Individuation process with the religious or transcendent dimension of an accomplished life. Later P. Otto told us about special prayers (credo prayers) and Kreuzgänge (walking silent cross walks) how we can show God we are ready. Now here the monks moved from pantheism to the loving Christian trinity. 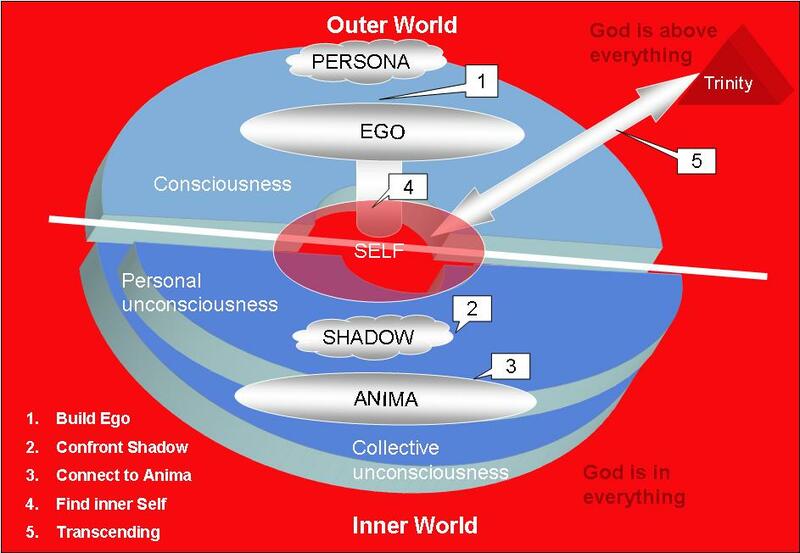 The communication between the personal God and us as individual is facilitated by the Self, our window to God.The bigger the pipe is between Ego and Self, the easier it is to experience God. Autonomous complexes or an inflated Ego prevents that. I have never heard it so clear. The theoretical distinctions of the Self in the different teachings is often unclear and undifferentiated. For the psychologist C.G. Jung the ‘Self’ is an empirical concept for the total amount of all psychic phenomena in humans. It expresses the oneness and wholeness of total personality. The general question in the search for the ‘Self’ is: How can the lives of people succeed? The Prior formulated it in a Christian way, explaining how to follow Christ; aiming to the realization of the true ‘Self’. I believe that, together with psychoanalytical contribution of C.G.Jung, the Catholic faith sheds light on the basic “W” questions but also helps in this life. Jesus’ approach to the individual and freedom is unique. We are nor slaves of a cruel god, nor impersonal white noise to resolve our Ego better sooner than later in nothingness, nor a bunch of neurons (mis)firing. 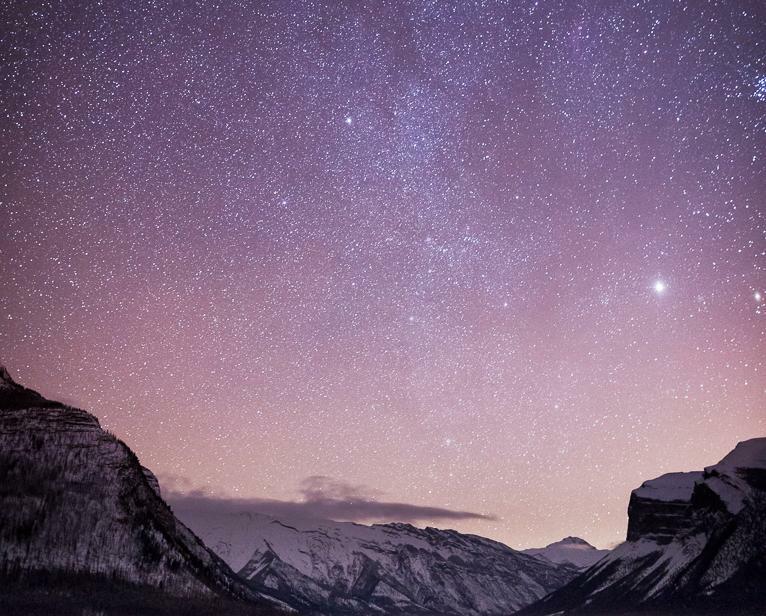 As the Prior said: “we can look into the starry sky and say Du,Du, Du”. And I would add, fully aware of todays astrophysical knowledge of our universe. Psychological schools are just models. We can’t see atoms or quarks nor can we see our soul. Therefore scientists and psychoanalysis come up with models, to understand and predict based on empirical data. Even if the Self is a non-uniformly used term with their psychological, sociological, philosophical and theological importance variants, the Jungian model is the closest to Religion. While Freud and Adler considered very narrow psychological drives, C.G. Jung understood the central integral concept of the human psyche as the Self. This Self is the wholeness of the human psyche and connecting the conscious and unconscious parts of the personality and aims toward the harmonization of the psyche. Only the ego-consciousness has the equipment to process deliberately sensory perception and thinking, feeling, and intuition. 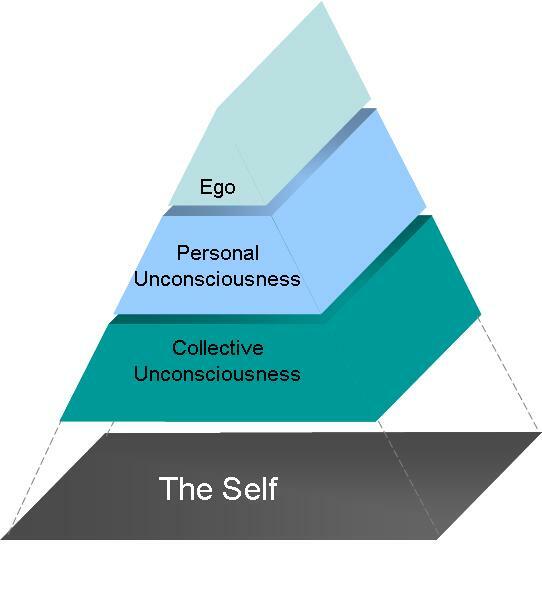 The unconscious part of the us, which splits in the personal unconscious and the collective unconscious, is larger and often more powerful than ego-consciousness. The ego,on the other hand can run amok and super-inflate. The Self is the center of the whole personality and therefore the central window or “membran”as Pater Otto called it to God. As I interpreted the Prior Claudius, it is also the Place where God or Jesus is in us. The Ego is the conscious of self, his eye, with whose help the self itself can recognize. The self is the God in us. Individuation is to be who one really is, and thinks a differentiation process that has the development of all skills, systems and possibilities of the individual through gradual awareness and realization of the self to the target. Religion is to C.G. Jung the opportunity to discover the soul. For Freud as for Marx, religion is just opium. Jung sees the benefit of religion (especially of catholic flavor) to deal with many similar psychic circumstances. Today’s psychology – influenced by Freud – to me is Godless and today’s Western theology – influenced by the age of enlightenment – to me often lacks soul. Spirituality and religion, together with logic and science, is focus for individual and political healing. The most important insight, which I understood this day: The impending disasters right now around me, are a direct result of my buried shortcomings like a pretty big Ego which served me well in my career (i.e. the disaster in me). Its is directly linked to Jung’s reminder, the inner world is very real. The evil is in us. Who I was in the past, I who want to be in the future and how do I make the transition? How I reflect my undesired aspects of my personality and keep my identity here? What are root causes of interpersonal communication defects – last call to grow up? What are cause and effect of those significant problems in my current professional transition? How to use the current crisis as a momentum and I deal with transcendence and the death? What needs successful self-development within my current life situation (e.g., toward individuation, religiosity)? Does Evil exists – questions about the dualistic view (Good and Evil)? Does the hell exist. Where does the picture of it come from? What is the opposite of belief (trust in God) what means believing? What is the opposite of love (indifference / egoism)? Usefulness of the religious church hierarchies and dogmas? Theory and praxis of dreams including dream phenomenology and hierarchy? Emphasis on Christ’s suffering versus Christ’s resurrection (central altar figure in St. Ottilien)? Fatherly versus motherly images of god (got lost of this one – thinking of Kali hardly a nice one). I was also astonished about the “Big Bang Didn’t need God to start universe doubt” discussion. To me, believing in God comes down to a personal experience that a benevolent deity is out there. People who are generally more intuitive in the way they think (in the Jungian sense) and make decisions are more likely to believe in God than those who ruminate over their choices. That suggests that basic differences of one’s personality type influences religious belief. Some say we believe in God because our intuitions about how and why things happen lead us to see a divine purpose behind ordinary events that don’t have obvious human causes. As on woman said in the discussion, “I translate believe in trust”. Individual’s belief is influenced by how much we trust natural intuitions. In the end, God can only be known by personal experience not by logic. If one does not experience god, too bad (for her or him). 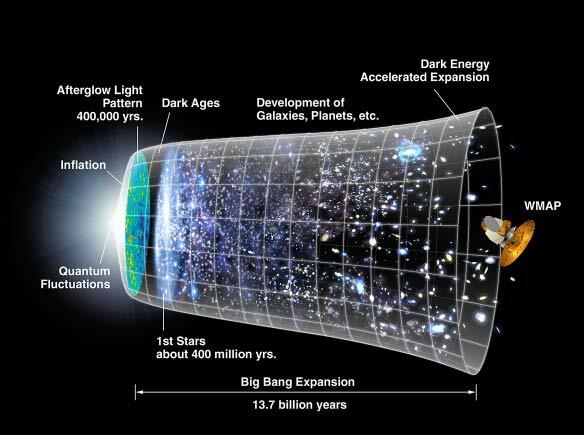 True, big bang and quantum mechanics describe random fluctuations which can produce matter and energy out of nothingness. But quantum mechanics are just (proved) models too. I don’t doubt that physical laws can “produce” the cosmos. The Persona : “The Persona is that which we present to the outside world. It isn’t really our selves, though there is a danger we can identify too much with it and believe it to be so. It is a mask. It’s not a bad thing to have, in fact it’s necessary for getting along with others. The Ego: “The ego is the centre of consciousness. It is identity…But it is not the totality of the psyche. The Self: “The Self is simply the centre and the totality of the entire psyche. It is the transcendental archetype which contains all the other archetypes and around which they orbit. Where God is within you, if you believe in God. The Collective Unconscious lies under our personal unconscious, and contains the archetypes and mythical symbols that make up our human psyche. Connection to this in a healthy way is necessary for wholeness. Complexes centers of physical energy (The can be autonomic, good or harmful and take over control. Synchronicity—when two or more events happen in a meaningful way to a person, and reveals something about our unconsciousness . Individuation is central to all religion and all healing. Quantum fluctuation is the temporary change in the amount of energy in a point in space arising from Werner Heisenberg’s uncertainty principle in quantum physics. That means that conservation of energy can be violated, but only for small times. This allows the creation of particle-antiparticle pairs important in the origin of the structure of the universe according to the model of inflation. Tags: Buddhism, C.G.Jung, Catholic, Philosophy, religious retreat, Taoism. Bookmark the permalink.